Now, researchers at the Wyss Institute at Harvard University and MIT&apos;s Computer Science and Artificial Intelligence Laboratory (CSAIL) have created origami-inspired artificial muscles that add strength to soft robots, allowing them to lift objects that are up to 1,000 times their own weight using only air or water pressure. The study will be published this week in Proceedings of the National Academy of Sciences (PNAS). "We were very surprised by how strong the actuators [aka, "muscles"] were. 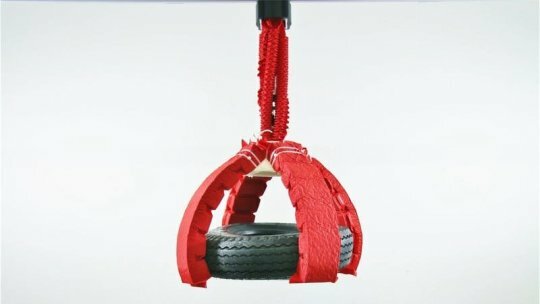 We expected they&apos;d have a higher maximum functional weight than ordinary soft robots, but we didn&apos;t expect a thousand-fold increase. It&apos;s like giving these robots superpowers," says Daniela Rus, Ph.D., the Andrew and Erna Viterbi Professor of Electrical Engineering and Computer Science at MIT and one of the senior authors of the paper. "Artificial muscle-like actuators are one of the most important grand challenges in all of engineering," adds Rob Wood, Ph.D., corresponding author of the paper and Founding Core Faculty member of the Wyss Institute, who is also the Charles River Professor of Engineering and Applied Sciences at Harvard&apos;s John A. Paulson School of Engineering and Applied Sciences (SEAS). "Now that we have created actuators with properties similar to natural muscle, we can imagine building almost any robot for almost any task." Each artificial muscle consists of an inner "skeleton" that can be made of various materials, such as a metal coil or a sheet of plastic folded into a certain pattern, surrounded by air or fluid and sealed inside a plastic or textile bag that serves as the "skin." A vacuum applied to the inside of the bag initiates the muscle&apos;s movement by causing the skin to collapse onto the skeleton, creating tension that drives the motion. Incredibly, no other power source or human input is required to direct the muscle&apos;s movement; it is determined entirely by the shape and composition of the skeleton. "One of the key aspects of these muscles is that they&apos;re programmable, in the sense that designing how the skeleton folds defines how the whole structure moves. You essentially get that motion for free, without the need for a control system," says first author Shuguang Li, Ph.D., a Postdoctoral Fellow at the Wyss Institute and MIT CSAIL. This approach allows the muscles to be very compact and simple, and thus more appropriate for mobile or body-mounted systems that cannot accommodate large or heavy machinery. "When creating robots, one always has to ask, &apos;Where is the intelligence -- is it in the body, or in the brain?&apos;" says Rus. "Incorporating intelligence into the body (via specific folding patterns, in the case of our actuators) has the potential to simplify the algorithms needed to direct the robot to achieve its goal. All these actuators have the same simple on/off switch, which their bodies then translate into a broad range of motions." These muscles can be powered by a vacuum, a feature that makes them safer than most of the other artificial muscles currently being tested. "A lot of the applications of soft robots are human-centric, so of course it&apos;s important to think about safety," says Daniel Vogt, M.S., co-author of the paper and Research Engineer at the Wyss Institute. "Vacuum-based muscles have a lower risk of rupture, failure, and damage, and they don&apos;t expand when they&apos;re operating, so you can integrate them into closer-fitting robots on the human body." "In addition to their muscle-like properties, these soft actuators are highly scalable. We have built them at sizes ranging from a few millimeters up to a meter, and their performance holds up across the board," Wood says. This feature means that the muscles can be used in numerous applications at multiple scales, such as miniature surgical devices, wearable robotic exoskeletons, transformable architecture, deep-sea manipulators for research or construction, and large deployable structures for space exploration. The team was even able to construct the muscles out of the water-soluble polymer PVA, which opens the possibility of robots that can perform tasks in natural settings with minimal environmental impact, as well as ingestible robots that move to the proper place in the body and then dissolve to release a drug. "The possibilities really are limitless. But the very next thing I would like to build with these muscles is an elephant robot with a trunk that can manipulate the world in ways that are as flexible and powerful as you see in real elephants," Rus says. "The actuators developed through this collaboration between the Wood laboratory at Harvard and Rus group at MIT exemplify the Wyss&apos; approach of taking inspiration from nature without being limited by its conventions, which can result in systems that not only imitate nature, but surpass it," says the Wyss Institute&apos;s Founding Director Donald Ingber, M.D., Ph.D., who is also the Judah Folkman Professor of Vascular Biology at HMS and the Vascular Biology Program at Boston Children&apos;s Hospital, as well as Professor of Bioengineering at SEAS.